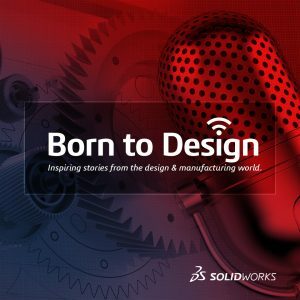 Welcome to the Born to Design – SOLIDWORKS Podcast. Born to Design takes you inside the most fascinating stories coming out of the design and manufacturing world. You will hear the surprising backstories of amazing creators; harrowing near-failures that became overnight successes; and uplifting examples of the many ways our community is changing the world for the better. Born to Design is a podcast for dreamers, designers, and creators of all kinds. I have included the first three podcasts for you here, but be sure to subscribe using one of the links below so you’ll never miss an episode. No Excuses to Get Outdoors with Christian Bagg—An outdoorsman and inventor, Christian designed his own wheelchair after a serious snowboarding accident left him without the use of his legs. His story is an amazing example of when you combine right attitude and tools, design can change lives. Just Say Yes to STEM with Betty Baker—From assembly line worker to her company’s first female mechanical engineer, Betty lives to break down barriers. Now a SOLIDWORKS User Group leader, she’s working hard to get more women involved in STEM. Hear her talk and get inspired! Designing in Crisis with Dara Dotz—Whether designing new solutions to aid Syrian rescue missions or building solar panels to bring power to hurricane-ravaged islands, Dara’s organization Field Ready is living proof that design and manufacturing firms can, AND WILL, change the world for the better. More episodes are on the way. Subscribe to Born to Design now from the links below and never miss another minute!